Unified Modern, the new kid on the block. Going into this round, the Community was feeling kind of down. They had jumped out to a nice early lead in the Scars of Mirrodin Draft event. Unfortunately, the Multiball Duels of the Planeswalkers 2012 Archenemy event did not go as well, with the Wizards team KA-RUSHING them in every match, netting themselves 30 free points. That gave them a 10-point lead going into the Modern Event. The board did not look like this before Multiball. MULTIBAALLLLL!!! 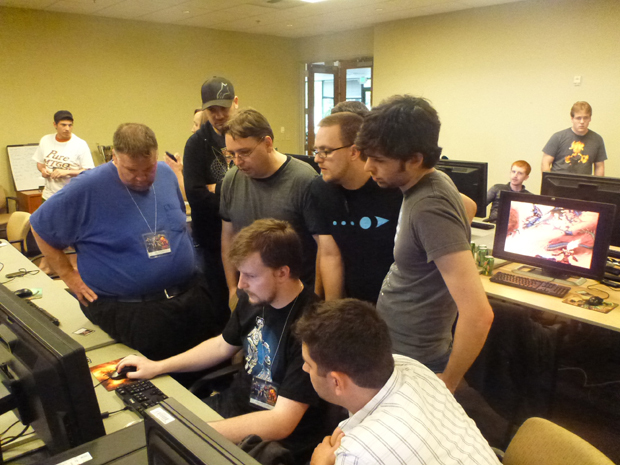 There was a lot of trash talk before the event, with most of it coming from Dave Guskin, Max McCall, and Zac Hill, two of whom were responsible for the current hole in which the Community team found themselves. 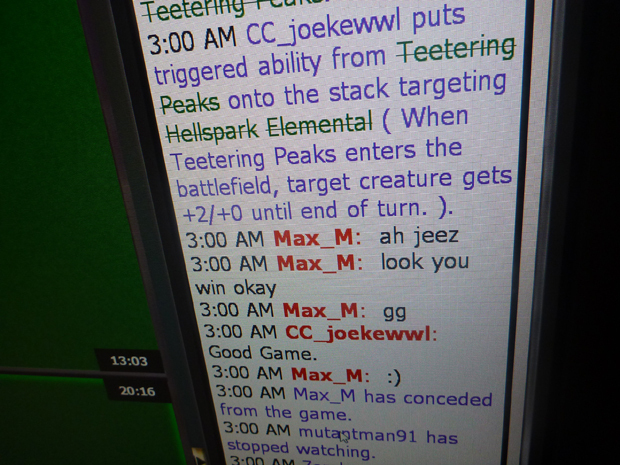 One nice little nugget of fire came in a surprising manner thanks to Lee Sharpe, who introduced himself as the man who makes Magic Online System Alerts. Luis Scott-Vargas and Bing Luke, who were the primary builders of the Modern decks, had good things to say about the format. "There are some pretty fast combo decks in the format. I think Hypergenesis is going to be a deck to watch for. It can kill on turn three...or two...or really one, I guess," LSV said with a laugh. Luke contributed that they "built all the decks they liked from the past few Extended seasons and tried to figure out what we were missing." "Yeah, we didn't make any new decks. I'm definitely sure there are new decks out there to discover. The cards in this format haven't been together without all of the older Legacy cards around them. Someone is going to find something. We didn't want to work on decks we didn't know incredibly well and be unsure how they stacked up, so we stuck with what we knew," LSV explained. 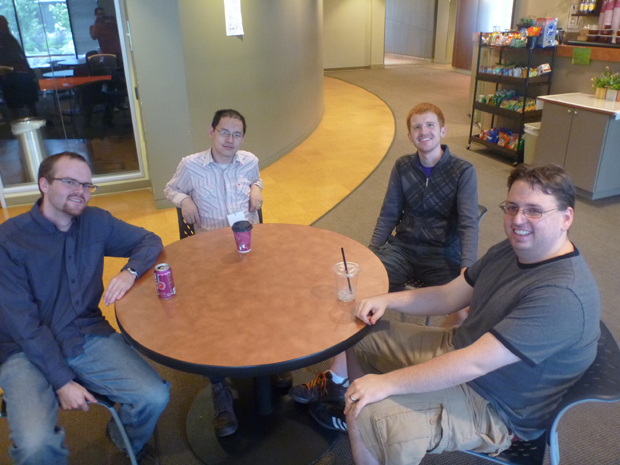 Some of the minds behind the first Modern tournament. One funny thing that they talked about was the presence of Umezawa's Jitte on the banned list. "When we were building our decks, we didn't have Jitte in any of them. When I asked Bing if the Stoneforge deck wanted a Jitte in its board, he told me it was banned. I didn't know, and it wasn't the reason we didn't have any in the decks," he laughed. He went on to explain that he figured the format would be too fast for the card to be really impactful. It was mostly good in the mid-range creature deck mirrors, which don't really exist in this format. The first round saw a slight changing of the tides, and a return to excellence for the Community team. There were some great moments. Whiffy won one of his games at one life against Dave Guskin's Elves deck by resolving Scapeshift for exact damage on the last possible turn. In Erik Lauer's match against Marshall Sutcliffe, he brought an Iona, Shield of Emeria and named blue, which mattered very little when Marshall completely wiped his board with a Wrath of God off the top of his deck! Lee Sharpe's match against LSV had one game come down to LSV passing the turn in preparation to kill Lee oh his next. Lee had one copy of Shrapnel Blast, but not the second one needed to finish him off in the window. At the end of the round, the Community had crawled back to within two points, ready to surge and take the lead. Max was not the only Wizards player to say this in Round 1. And surge they did! They absolutely dominated the Wizards team in the second round! The only Wizards deck to win in the second round was Dave Guskin's Elves deck, which completely overpowered Bing Luke's Faerie's deck. 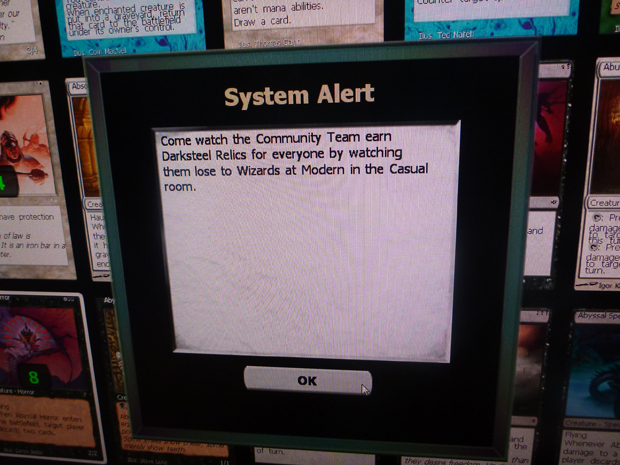 Other than that, the Community just ran roughshod over the Wizards crew, some matches closer than others. In Max McCall's match against ChrisKool, Chris managed to attack with his large men into Max's team, which was forced to chump block. That left him with three lands, no board, and 2 life. After untapping, Max's Ancestral Vision unsuspended, drawing him three cards. In those cards? Wrath of God and Hallowed Fountain. Since he was at 2 life, McCall couldn't get it to come into play untapped, preventing him from casting his Wrath of God. It was an unfortunate confluence of events that gave the match to Chris. With the 7-1 performance of the Community Team, they took a massive lead, 95-127. Your powers combined, I am Captain Community! The final round was no kinder to the Wizards team. 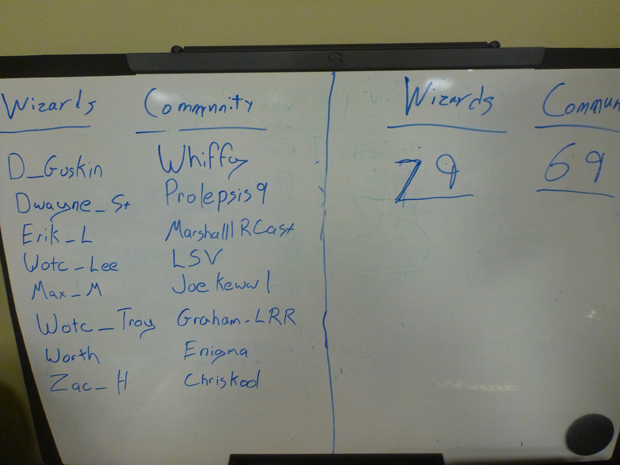 Match by match, Wizards employees fell to the merciless onslaught of the Community. 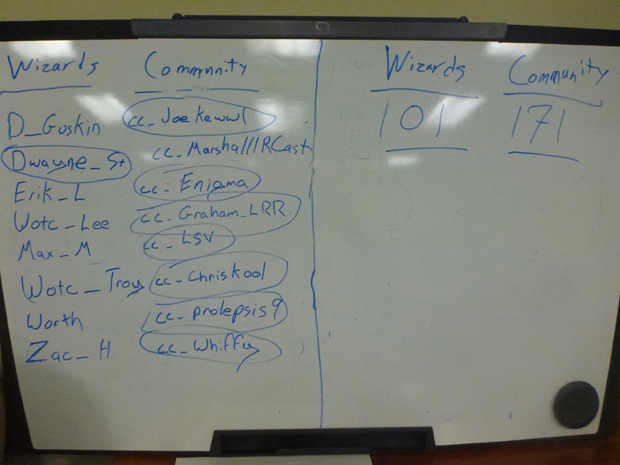 Clearly riding their momentum, the Community manage to defeat all of the Wizards employees save Dwayne St. Arnauld and his Hypergenesis deck. When the last game was settled, the Community had managed to surge from a ten point deficit to a 70-point lead! Half of the team went undefeated: JoeKewwl with his monored deck, Enigma with Hypergenesis, Whiffy with Scapeshift Valakut, and LSV with Elves (obviously). Looking at the decks presented by both teams, there were many similarities. Both teams had Jund, UW Stoneforge, Elves, and Hypergenesis decks. From there, things differed. The teams ran two different versions of monored, with JoeKewwl's version being a bit more successful than Lee Sharpe's Kuldotha Red. Both teams opted for an alternate combo deck, with Whiffy's Scapeshift edging out Zac Hill's Dragonstorm in the win column. The aggro deck of choice was different as well, with ChrisKool running Junk as opposed to Troy Reppas's White Weenie deck. The last difference was a stylistic choice. The Community team ran a Faeries deck in place of Erik Lauer's Troll-less Dredge deck. In the end, the matchups and deck differences fell in the favor of the Community team, and they will take a commanding 171-101 lead into the final event: Unified Standard! Wizards is going to have to break out the brooms tomorrow if they want to avoid the threepeat!